Just too awesome! It looks like the star magnets finish. Congrats on all your views! This mani is totally amazing. 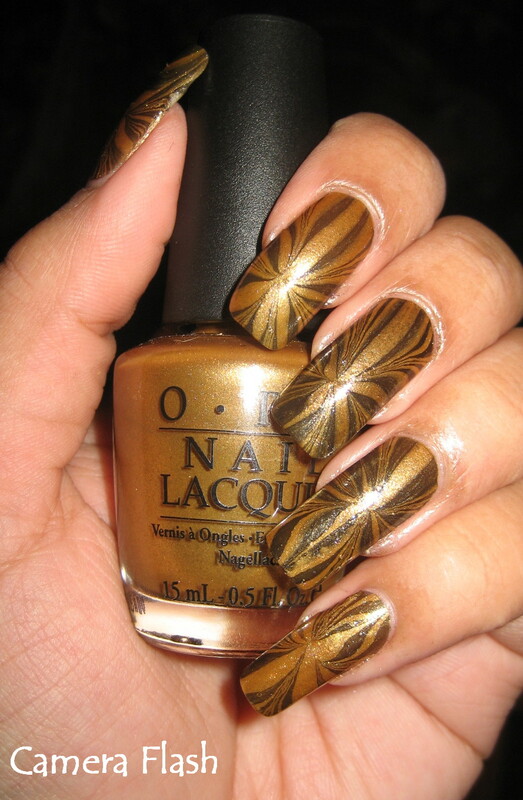 The way you got them all to centre on each nail perfectly is fan-tabulous! 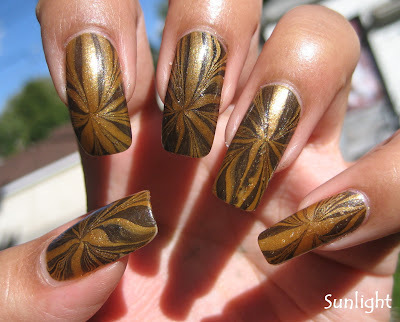 I love this I watched it on the tube yesterday and love the way you do your marbling. A really pretty design! I love watching your water marbling tutorials, you always make them look so easy :). I really love your water marbling tutorials and I've often tried to make it on my own. I just have one problem all the time, there are little bubbles on my nails filled with water. Can you tell me what's going wrong? WOW, this is really stunning. Love the gold and black combination. A MILLION hits? 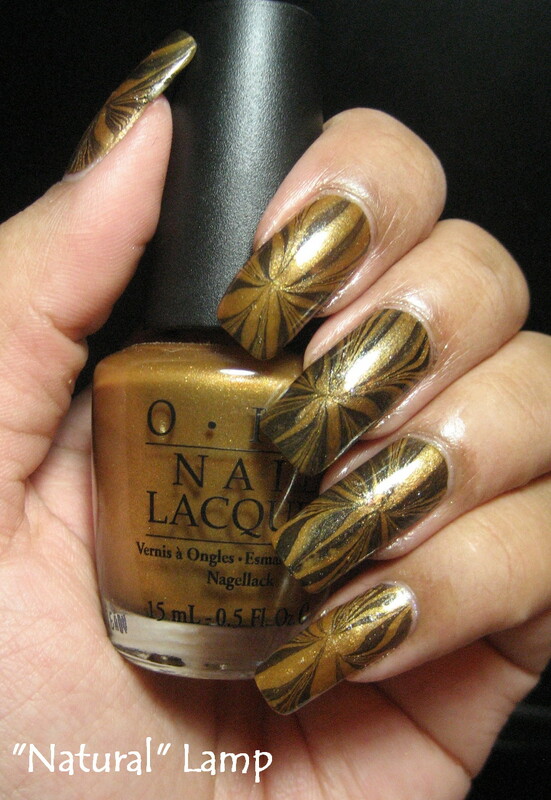 Wow, that's just amazing, but ofcourse your tutorials and awesome mani's deserve to be seen that much! Thanks a lot for Your great tutorials. Especially these water marbling videos totally rock. After watching few of them I was convinced that I could be able to do some marbling also (not so profs of course, but something never the less) and started my experiments. But sadly my polishes did not spread on the water at all and when I tried to draw lines to them, they just got stuck on the stick. Maybe my polishes were too thick or too fast drying. But I will not give up, so pretty Your nails look. Have to try later with different polishes. It's amazing how the design is centered on your nail. 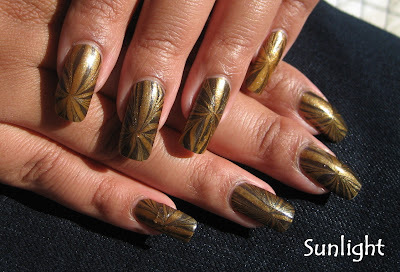 The gold & black made a beautiful pattern on your nails. Very Egyptian Scarab-y. Awesome manicure! It looks great!!! I´m going to try it myself!! I would love to see a B/W Marble! anytime you have some extra minutes please do a black and white one! I´ve tried but it turned out grey on my hand... still don´t know what went wrong! lol!!! Love the blog! everything wonderful! I love this! 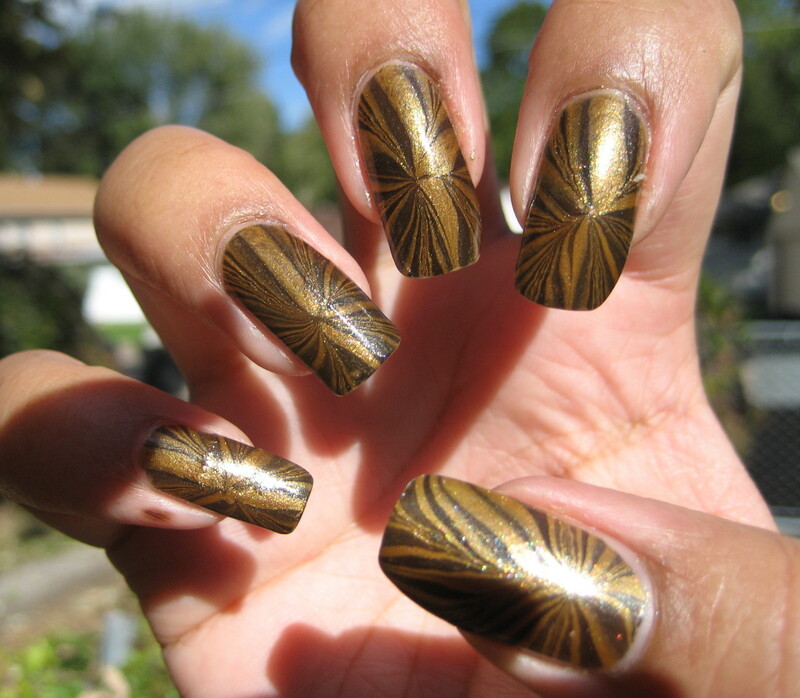 I don't think I've ever seen a pinwheel water marble before. 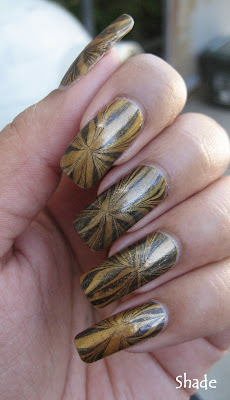 I really need to try marbling soon! This is lovely! i'm from Sweden and i just love your water marble tutorials on youtube. I've tried doing it myself but i didn't work out very well, but i get very inspired of your videos! I love nail arts and creating some of them myself, as you can see in my blog, under the category "Naglar" =). and sorry for my english haha. FANTASTIC! You know I love to marble and this is a great design idea! Nice work! I LOVE your work Colette, as a matter of fact I dont even wear nailpolish, but your creations sometimes seem too pretty to miss. I had a bunch of friends turned onto your channel and they are now subscribers. I hope you continue to flourish :) CHEERS! Wow, very informative and inspiring, thank you!